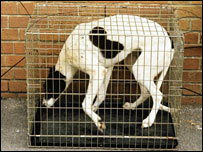 When Somerset and Avon police officers stopped a white van back in August 2005, they were shocked to find row upon row of racing greyhounds squeezed into cramped cages. One of the dogs was in a cage so small, it could not stand up. Under the Welfare of Animals (Transport) Order, animals must be able to stand and lie down on journeys. But Bernard McBride, 39, from County Tipperary, had been transporting the dogs to England from the Irish Republic like that for six years. In September last year, Bristol magistrates gave him a conditional discharge for three years and he was ordered to pay £4,000 towards costs, after he pleaded guilty to 10 offences. RSPCA inspector Glyn Roberts said the case exposed the "cruel practice" of transporting large numbers of dogs across the Irish Sea to fuel the racing greyhound industry. "The cages were not designed for comfort and safety but instead for transporting as many dogs as possible per trip, solely for financial gain. "This behaviour was shameful and must be condemned," he said.